Chugay’s In the Media Archives - Chugay Cosmetic Surgery Medical Clinic Inc.
Dr. Paul Chugay will be presenting a talk at the American Academy of Cosmetic Surgery (2018 Annual Scientific Meeting) – February 2018 in Las Vegas. A California plastic surgeon is performing what may well be the most bizarre, and punishing, weight-loss procedure short of an outright limb amputation: tongue patches. Since 2009, Dr. Nikolas Chugay has been suturing stamp-size patches of Marlex mesh to patients’ tongues. The patch makes it painful to eat anything solid. The patient leaves it in place for a month or so — or less, if it becomes unbearable — while subsisting on an 800-calorie-a-day protein shake diet provided by Chugay. The doctor and his son, Paul, also a doctor, say on their website that they have done this procedure more than 150 times. Patients typically lose around 20 pounds, and have flown in from around the country for the $2,000 procedure. Introduction: “Nothing beats a great pair of legs!” So goes the famous 40-year-old advertising slogan of name-brand pantyhose maker L’eggs, a slogan still used today because it conveys a timeless truth: Shapely stems get noticed. Trouble is, it takes more than decent nylons to produce fabulous-looking legs. Introduction: Surgical Techniques help men to obtain better bodies. Remove extra fat here. Add a pair of silicone implants there. Voila! A new and improved male body. Introduction: It wiggles like Jell-O and adds cush to the flattest tush. 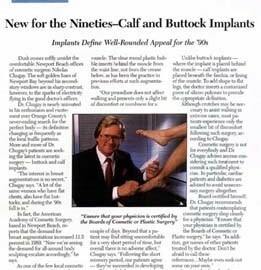 Just in time for the wider-body ‘90s the buttock implants has arrived. For a mere $4,000 a fanny, plastic surgeon will put the bilk back – much faster than it took to take it off. Introduction: Dusk comes softly amidst the comfortable Newport Beach offices of cosmetic surgeon Nikolas Chugay. The soft golden hues if Newport Bay beyond his second-story windows are in sharp contrast, however, to the sparks of electricity flying in the good doctor’s offices. Introduction: The body conscious people of LA do everything to stay slim and toned. Nevertheless, a little bulge can sometimes show up, even on the best bodies.